In January 1910 Kate Frye is paying a short visit to Ditchling in Sussex, staying with her dear cousin, Abbie, and her husband, Basil Hargrave, at their home, Chichester House, 11 High Street, Ditchling. 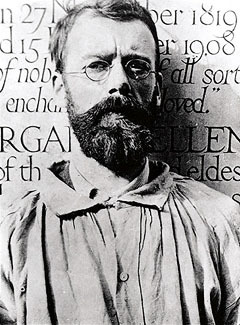 Eric Gill, engraver, calligrapher, printmaker, typeface designer and sculptor had settled in Ditchling in 1907, attracting a community of craftsmen – and women – to the village. Abbie was a prolific novelist, who wrote under the name of ‘L. Parry Truscott’. Here we can see the parish church, St Margaret of Antioch, where Kate endured a ‘long dull sermon’. Abbie and Basil are both buried in the churchyard. Eric Gill’s house, Sopers, was at 28 High Street. Much later, in 1930, Abbie’s son, Truscott Hargrave (b 1911) was to become secretary to the Saint Dominic’s Press, founded by Gill (who had by then left Ditchling). Mr Wheelwright, whom Kate found ‘one of the most bitter and arrogant conservatives’, was William Wheelwright, an Australian-born worker in silver and copper. 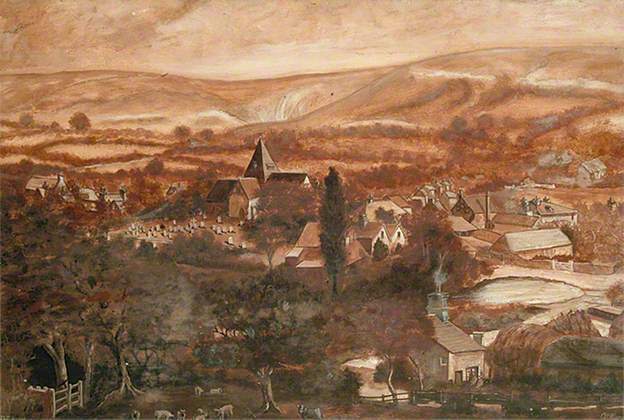 His wife, Helen Maud, was a Gloucestershire-born artist. Abbie busied herself after breakfast and I sat over the fire and read the papers and then wrote a couple of letters before helping Abbie arrange the dining room and drawing room for the afternoon. Then just before 12 o’clock we went out for an hour’s walk towards the Downs. We took the sheepdog, Bay, with us – he is at present the latest addition to the family party at Chichester House. Lunch at 1 o’clock – then we did a few more jobs – and Alice the maid began laying the tea and we put out the cakes and at 3 o’clock we went up and changed our dresses as the party commenced punctually at 4 o’clock. We were 23 in all. only 3 men. Basil, the Vicar and the man, Mr Gill, who read the paper to start the debate. It was quite a clever paper – but he did not make it interesting really and it was not a popular subject – ‘The arts and crafts in the home’ – very few made any remarks at all and they were very far wide of the mark for the most part – some of them were very amusing. A Mr Davidson was really killing and the Vicar so pious. Basil’s speech was really the best as it did raise some points but no one took them up. It was over and everyone had gone soon after 6 o’clock. Abbie hastened on the dinner – we changed our things again for walking apparel, had dinner about 7 o’clock – and then went off to a political meeting in the schools – but as a great concession by the Vicar (a rabid Conservative) to the Liberal Candidate, Mr Basil Williams. The place was very full of those who thought otherwise and they were so noisy they were a great trouble to the speaker. There were very few of his supporters there and I should think I was the only Liberal woman in the place. It is a most Tory village. I much enjoyed the meeting but I must say I did not admire the spirit of some of the ‘hecklers’. One man who I found out was a friend of Abbie’s afterwards – a Mr Wheelwright was a fearful nuisance. There was a very good free-trade speaker first but he rather lost his temper with the folk and absolutely showed his teeth at them. Mr Basil Williams came on later from another meeting. A nice looking man and he spoke quite well. But he does not stand a chance – it is wonderful to get men to contest such seats, I think. A great crowd was waiting to hiss and boo him as he left in his motor car. What an ungrateful lot – to boo one of the party who gave them political emancipation. To the Parish Church where they have a pew by right with Chichester House. A bawling choir and a long dull sermon – but a beautiful old building. then for an hour’s walk. The roads very slippery until the rain started which it did just as we neared home. We went over Dr Lulham’s cottage which he has very nicely furnished but rather crowded. I should like to take it one day for a few weeks and stay in Ditchling. See here for details of the published edition of Kate’s diary – Campaigning for the Vote. 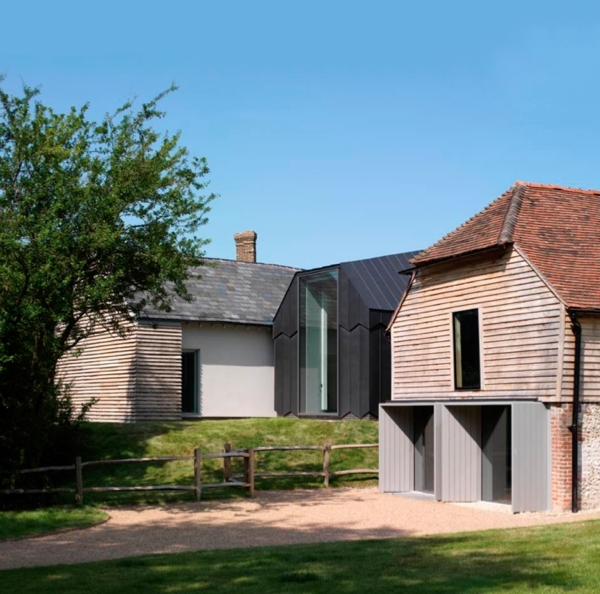 The Ditchling Museum of Arts and Crafts has just re-opened after a major refit. See here for new opening hours and here for some of the Museum’s past projects. For the Eric Gill Society see here. This entry was posted on September 26, 2013, 10:45 am and is filed under Kate Frye's suffrage diary. You can follow any responses to this entry through RSS 2.0. You can leave a response, or trackback from your own site.